Kosovo is one of the lesser known countries in Europe and a beautiful place to visit. We happened to be in Skopje at just the right time and upon hearing about it from a friend we decided to visit Kosovo on its independence day. Pristina is only a two-hour long bus ride from Skopje and we, therefore, decided to visit for a day. This list consists of my favorite things to do in Pristina, Kosovo. 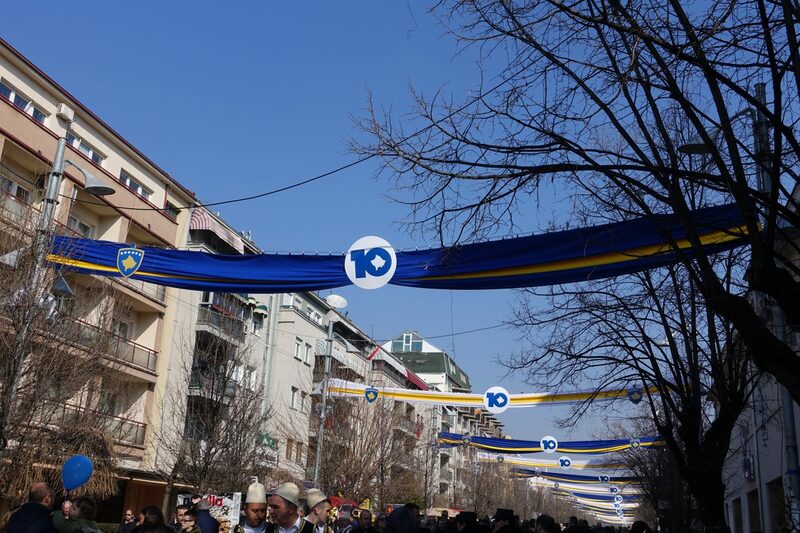 On February 17 Kosovo celebrated 10 years of independence although Serbia is still not acknowledging its sovereignty. There are also five EU members that do not recognize Kosovo’s independence: Spain, Slovakia, Cyprus, Romania, and Greece. 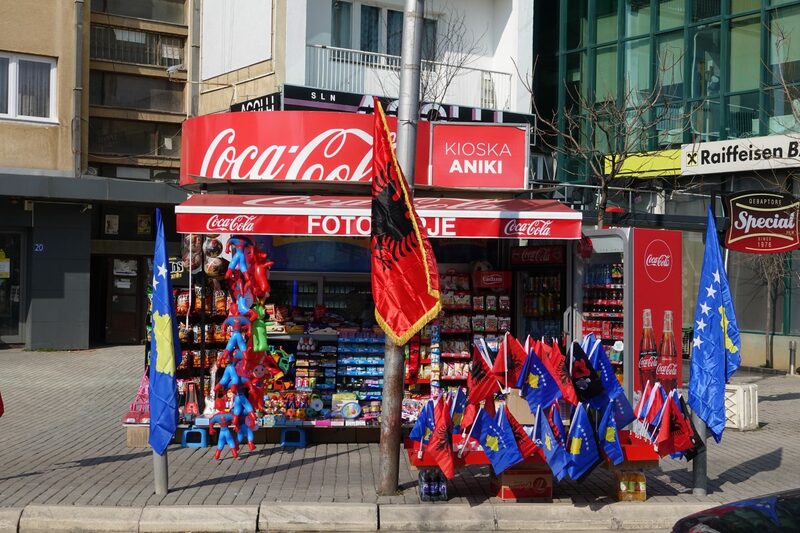 This was a huge day for the ethnic Albanian majority and the capital city, Pristina, was covered in blue, yellow and red colors of the Kosovan and Albanian flags. The streets were packed with people celebrating, there were music, food, and smiles everywhere. We felt very welcomed and greatly enjoyed spending a day in Pristina. Unfortunately, one day in the city was of course not enough and I will definitely be back to explore Europe’s newest country more. There is a lot to see in Pristina and these are 7 things that you can do in Pristina, Kosovo. 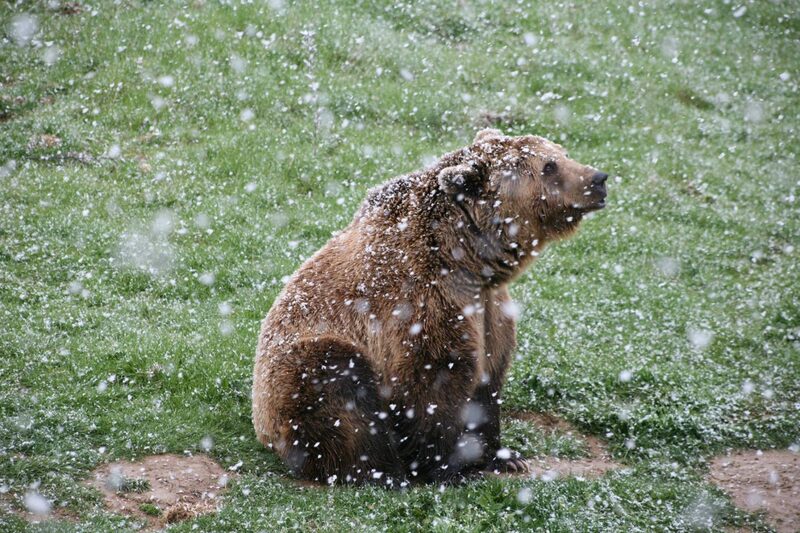 The bear sanctuary is just a 40 minutes drive outside of Pristina and is run by FOUR PAWS. Bears were oftentimes kept in small cages and outside of local restaurants for the purpose of attracting customers. In 2010, a ban on the private keeping of bears was enforced and FOUR PAWS stepped in and provided shelter for roughly 15 bears. Today FOUR PAWS has the exclusive right to keep brown bears in Kosovo and currently houses 19 bears. They have a facebook page and are super responsive, so if you are keen on visiting I’d highly recommend dropping them a message, to make sure that they are open. Unfortunately, due to time constraints, we did not make it to the bear sanctuary and I can’t wait to check it out next time I am in Kosovo. 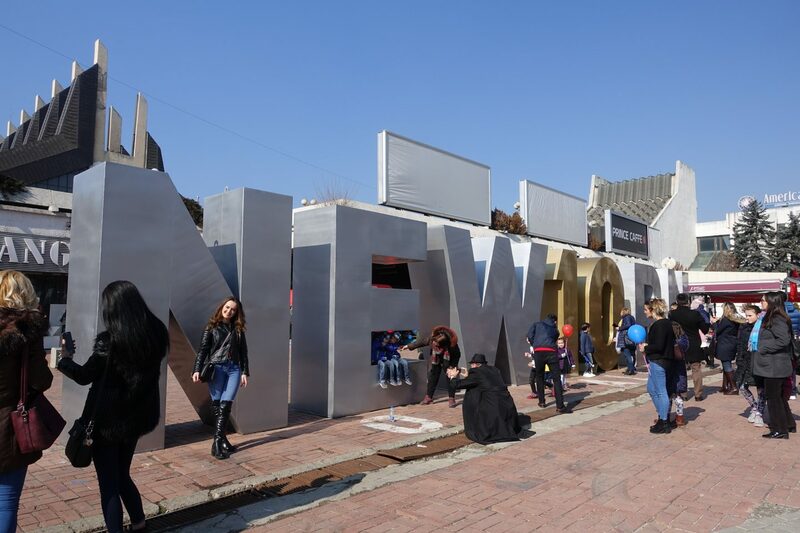 The newborn monument a typographic sculpture in Pristina, Kosov. It was set up on the day Kosovo declared its independence from Serbia, on 17 February 2008. When the monument was first revealed it was painted yellow and has since changed its colors every year. When we visited the monument on on 17 February 2018 it was surrounded by heaps of people taking selfies and group photos. For the 10 years of independence celebration, the monument actually changed to NEW10RN, in gold and silver. Wherever I go I love searching for and supporting vegan restaurants or places that are offering healthy food with vegan options. The minute I read about green + protein I knew I had to go. 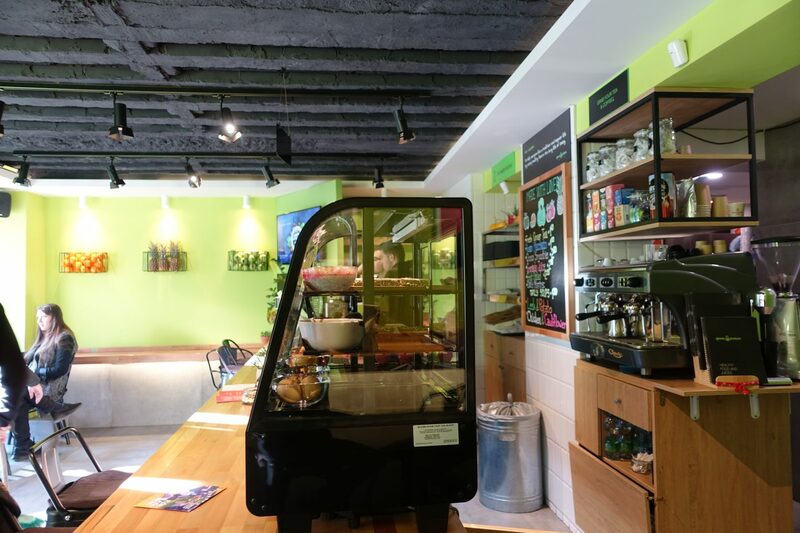 Green + protein is located in the heart of the city, on Rruga Rexhep Luci and offers food for vegetarians, omnivore, and vegans. They have a huge smoothie menu, freshly pressed juices, salads, burgers, soups, wraps, sweets and heaps more. Upon studying their menu I decided to go with their “Chocolate, Nut & Banana” smoothie (cashew mylk, banana, spinach dates, cocoa, almonds, and walnuts) and got their “Lentil Vegan Burger” to go. This was one of the best banana smoothies I ever had! There was something about that particular combo that just tasted incredible. 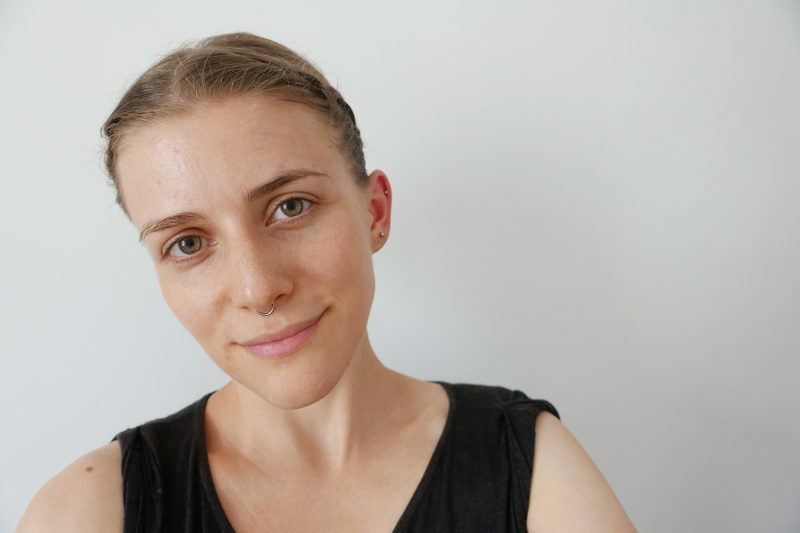 Both my partner and I also loved the lentil burger – it featured a whole wheat bun with a rice and lentil patty topped off with lettuce, tomato, pickles, carrots and tomato dressing. If you are in need of a healthy snack, I highly recommend checking out green + protein! The building was designed by Croatian architect Andrija Mutnjaković and built in 1982. The library features 99 domes of different sizes and is covered in a metal fishing net. The building is oftentimes described as ugly and I must say that I find its architecture fascinating and the building quite interesting. While I didn’t go inside, I explored it from all angles from the outside and consider seeing it a must if you are in Pristina. The ethnographic museum in Pristina can be easy to miss. 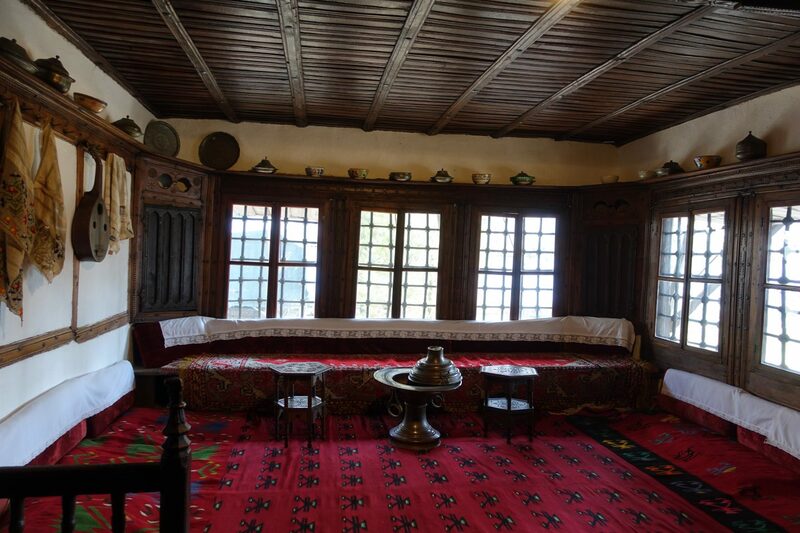 It is located in the Emin Gjiku Complex, a huge house with heaps of rooms from the 18th century. When standing outside it looks like a regular although old house and there is nothing indicating that it is a museum. The house used to be home to a large family of 35 people that moved to Turkey during the war. 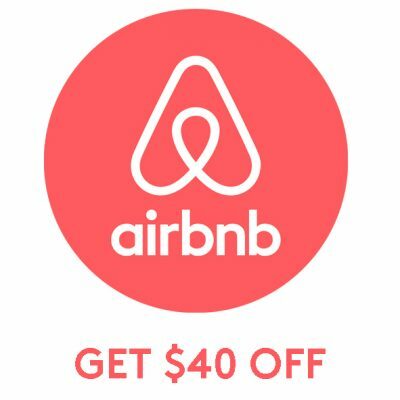 The property was then sold and is now owned by the government. 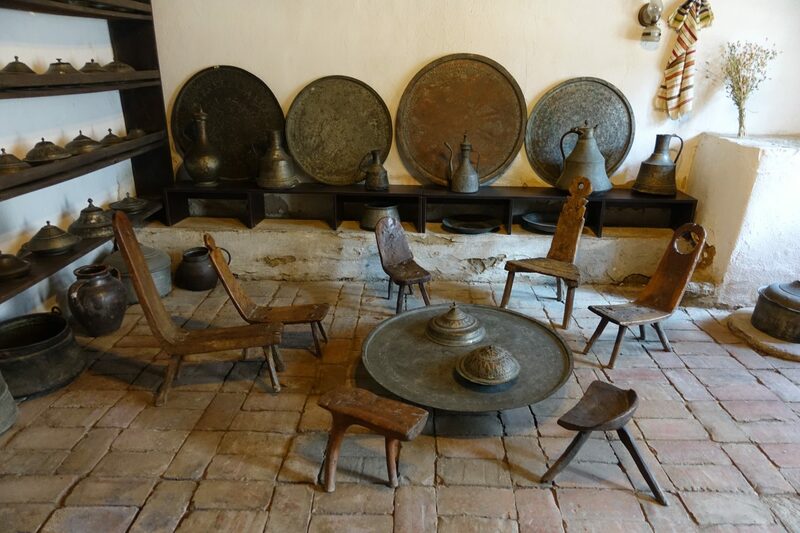 The museum consists of a handful of rooms in one part of the building and has furniture and tools from the lifestyle of this family during the Ottoman Kosovo period on display. The majority of the building is currently undergoing construction and only a small part can currently be visited. I absolutely love markets! Wherever I go I always make sure to visit the local markets. Shopping at and browsing local markets is, in fact, one of my favorite things to do while traveling. 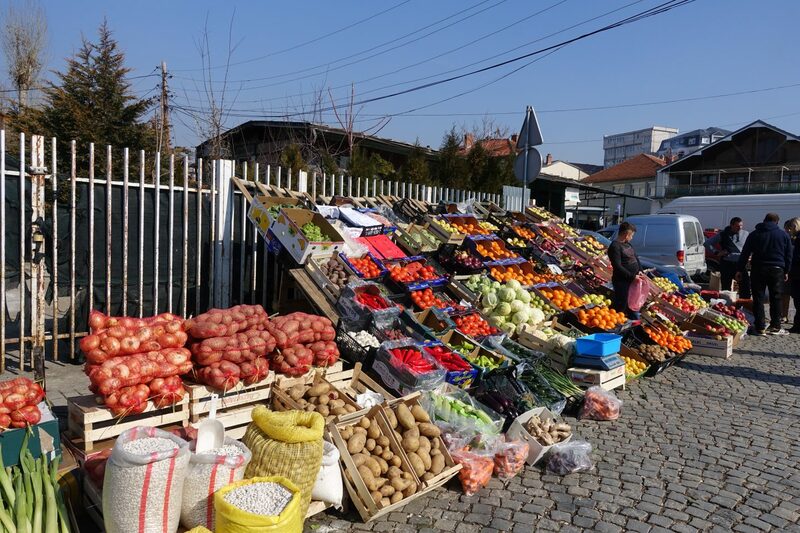 The main market in Pristina is located on Rruga Ilir Konusheci and offers fruit and vegetables as well as household goods. If you are looking for fresh fruit and vegetables, then this is your place. 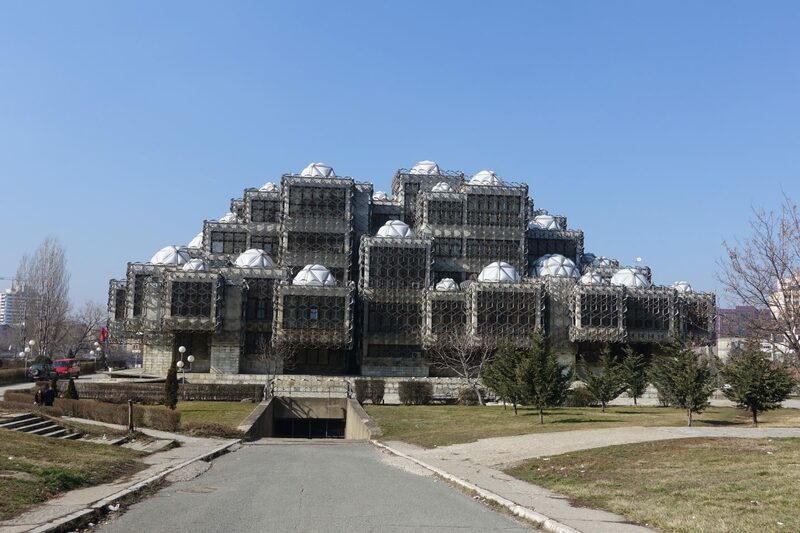 The Church of Christ the Saviour is an unfinished Serbian Orthodox Christian church in Pristina and is located right next to the national library. 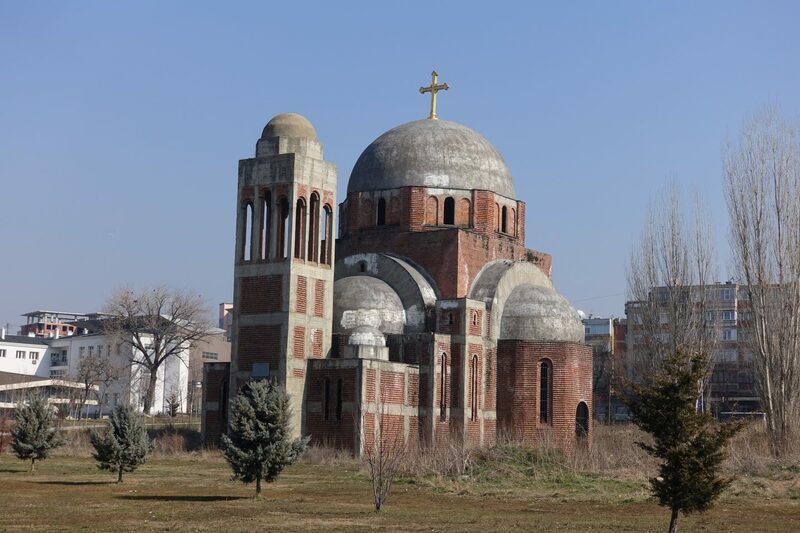 Construction began in 1995 and was due to be completed in 1999 however, its construction was interrupted by the Kosovo war and its future remains uncertain. The church was not welcomed by the predominantly Muslim population and remains a hugely controversial church to this day. I didn’t know about the church prior to visiting and was in awe when I first spotted it. I greatly enjoyed visiting Pristina and exploring it a little. Depending on the length and nature of your trip, I’d highly recommend visiting the city for several days, a week even. The people were incredibly friendly and we both had a great time in Pristina. Prior to hopping onto our bus back to Skopje, we needed to figure out where our bus departs from and the person behind the information desk was such a sweetheart. He left the information desk to greet us, welcomed us to Pristina, inquired about where we were from and even let us pay in Macedonian Denar (we didn’t have any euros on us). I am really glad that we decided to visit Pristina and highly recommend giving Europe’s newest country a chance and visit. 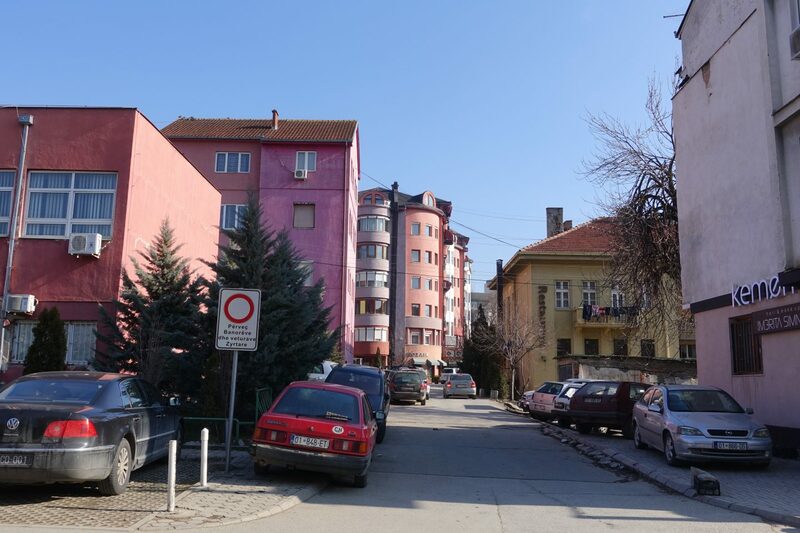 I love that you showcased history, art, and architecture of Pristina in one blog post. Now I wouldn’t forget the location and capital of Kosovo. The library is definitely intriguing. Good luck to the next trip.